When we talked about the resting cell membrane potential, we mentioned that they figured out the voltage of a neuron by sticking a microelectrode onto the membrane. We could study the generation of AP’s in neurons with the information from these probes. Eventually someone thought it would be interesting to stick this into the sensory neuron of an ear so we could understand how the sensory neurons of your ear respond to VOLUME. The problem is there’s not a lot of volunteers asking the researchers to stick these things into their body. Also, people will get mad if we do this on monkeys or even dogs, so in this study, it’s placed in the sensory neurons of a moth. It doesn’t matter if we study this in a moth, monkey or dog, it all works the same way. The spikes are actual recordings from a sensory neuron in the ear of a moth. In (a) the sound level is very close to the minimum necessary to bring the neuron to threshold and initiate action potentials. In (b) the sound has been increased by 7 decibels, in (c) by 15 decibels, and in (d) by 23 decibels. 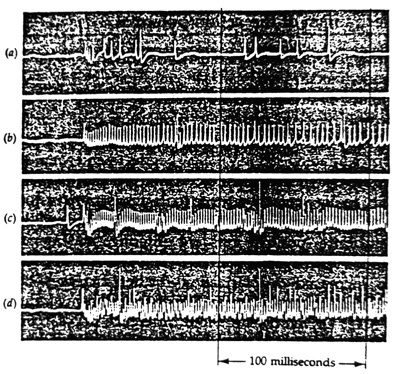 A period of 100msecs is indicated for purposes of comparison; note how the number of spikes per unit of time increases as the sound level increases. On the right: Each of these vertical blips is an Action Potential. In figure A, they play a very low volume sound and you could see a certain frequency of APs. In figure B they raise the volume and the frequency increases. In figure C they raise the volume more. The way our sensory neurons tell the intensity of sound (volume) is by the frequency of the action potentials they send. As the sound gets louder, the frequency increases. We know there’s a limit to these action potentials because we just learned that neurons can fire off a maximum of 100 APs/second due to the refractory period. That’s why if you’re next to a jet engine plane, and another jet engine comes next to you, you’re not going to be able to tell a difference because the stimulus is already maxing out the frequency of action potentials. Hearing: If you could hear someone talking, that means the voice is loud enough to generate action potentials in the sensory neurons of your ear. If they raise their voice, that causes an increase in the APs to your brain. If they lower their voice into a whisper, the frequency decreases. If they lower their voice to the point where you can’t hear them, then that means you’re not even generating ONE action potential. So if you can’t hear a sound, it doesn’t mean there’s no sound in the room, it means the sound is too soft for you to hear. During a hearing test, they give you headphones and play sounds and ask you if you could hear it. If they play a sound a normal person should be able to hear but you can’t, that means your hearing is not normal. This is the concept of a threshold stimuli. We know what a normal threshold sound is for a person to hear. Light: The same goes for LIGHT. If your eyes are not able to see at the normal threshold of light, then your vision is not normal. Touch: This includes touch too. If you’re having a picnic on the grass and you notice an ant on your skin and you wonder how you didn’t even feel it. That’s because the weight of the ant is so light that it couldn’t even trigger ONE action potential. Whether it’s the loudness of a sound or the brightness of light or touch, this is how sensory neurons work. Motor neurons work the same way as well. Try this: Gently put your hands up under the desk. Now slowly try to lift it. Do you notice how your muscle is getting stronger and stronger? We increase the strength of our muscles by increasing the frequency of the AP’s. The higher the frequency, the greater the intensity.